Tomorrow morning from 6am-12pm BestBuy stores will run a post-Thanksgiving day sale. 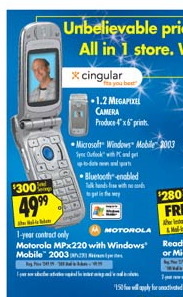 In the sales circular BestBuy is advertising the Motorola MPx220 for $349.99 and a $300 mail-in rebate, bringing the final price down to just $49.99. This makes the deal much lower than the previous MPx220 deal we featured, $199 at Amazon.com.